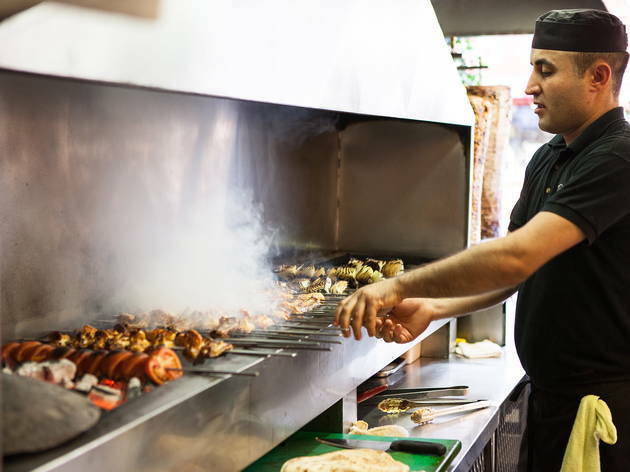 Large, utilitarian – and the gobsmacking go-to venue for prodigious portions of excellent cooking in London’s main Turkish neighbourhood. 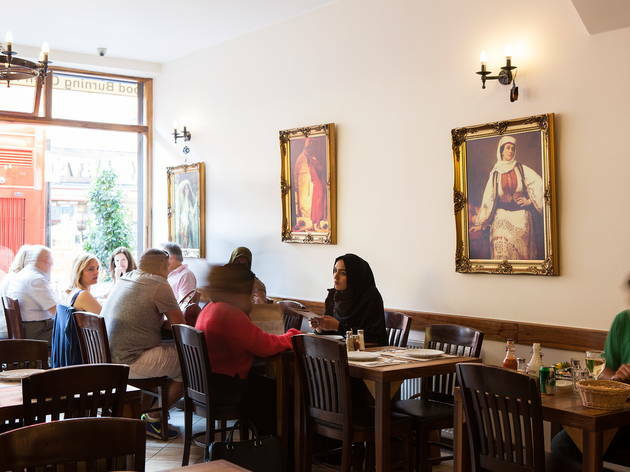 If our informal poll of passers-by on Green Lanes is anything to go by, Gökyüzü is the go-to place for Turkish food in London’s main Turkish neighbourhood. This large, utilitarian restaurant (it doubled in size some years ago) is consistently the busiest place on the strip. It’s clear why: the prices are low, the cooking is excellent, and the portions are generous bordering on reckless. We were almost sated after demolishing a basket of bread cooked in the wood-fired oven and a huge ‘small’ mixed meze dish – highlights being a sprightly kısır loaded with mint and spring onion, a haydari rich with dill, and a fresh-tasting soslu patlıcan (grilled aubergine with tomato sauce). The mains were exceptional. Sarma tavuk beyti featured no less than 15 large pieces of spicy minced chicken wrapped in lavash bread, slathered in tomato sauce and served with yoghurt and pilaf rice. 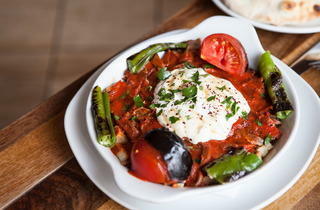 Güveç (lamb and aubergine casserole) had been stewed to tender perfection in an earthenware pot. Service tends to be rushed and the wine list is short (there are only five whites), but you wouldn’t come here for a leisurely drink. Food is the thing at Gökyüzü. Amazing value, never a disappointment and certainly the best Turkish food on Green Lanes, which in that area is full of tough competition. We visited gokyuzu on a Saturday night, so as expected the restaurant was very busy. The food is amazing, we got bread dips and salad all on the house as a complimentary starter followed by an array of kebabs, shish and fish all very reasonably priced. The only downside is that the restaurant is very busy and the staff are rushing around a lot so the atmosphere can feel slightly flustered. Although busy the food was served relatively quickly and all together which was great as we were a table of 15. Definitely worth a visit - I would go again. Delicious find at an unfamiliar part of town is always a great way to spend your weekend. Casual and friendly atmosphere with a massive menu to boot. Can't fault the taste and value of the food, but due to its popularity the staff seemed over worked and not the friendliest bunch. Take friends and share your food, because the plates are massive, and you'll want to try more than one! 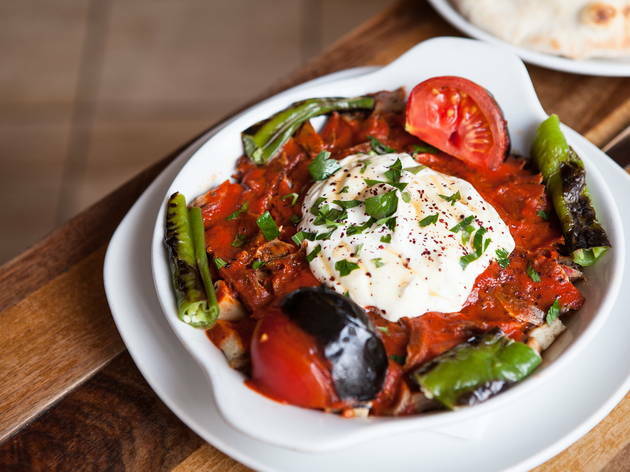 If you're looking for affordable and wholesome Turkish food that beats the tainted 3am kebab which we are all familiar with, then Gokyuzu is the place to go. 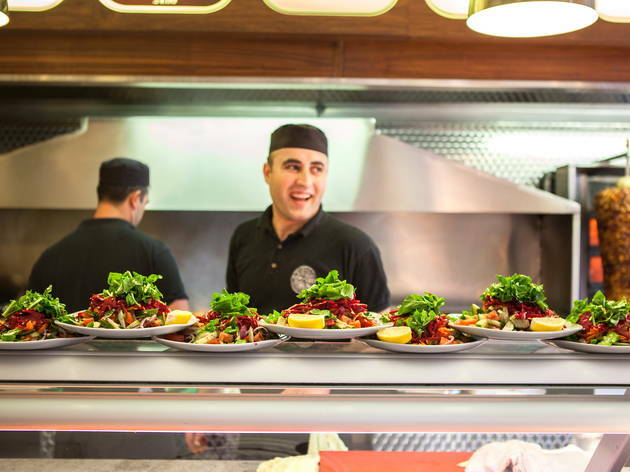 Immerse yourself in this Turkish restaurant as the waiters provide free (yes, FREE!) 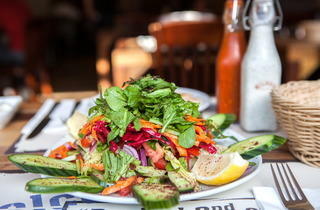 salad, tsatziki and Turkish flatbread while you wait for your delicious main of scrumptious meat.. Sadly I can no longer eat the flatbread as I am Coeliac, but have very fond memories of it. However, as a Coeliac this type of restaurant is perfect. Given the vast amounts of salad, dips, chips, rice and meat you devour there is little room for bread and it by no means feels like you have missed out. The waiters are kind, attentive and conscientious of dietary requirements such as mine making you feel at ease. The great thing about this restaurant is that all the meat is excellent, if you too are a hopeless carnivore then you will not be disappointed. 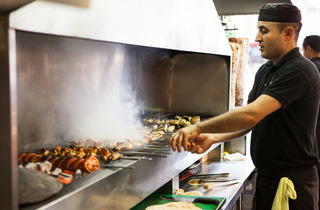 I normally order the Cop Shish which is tender grilled cubes of lamb on a skewer. Everything about it is perfect.The meat melts in your mouth and soaks up all of the heavenly chilli and garlic sauce provided by the restaurant and is a match made in heaven with the free lemony salad that they keep topping up. 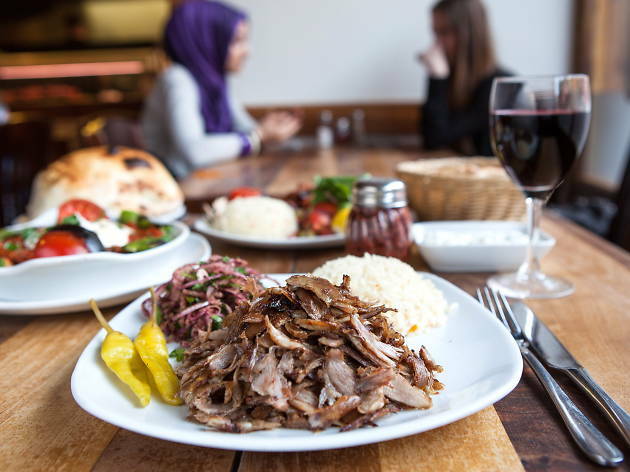 So, if like me you cannot resist an affordable yet gastronomic delight,then head on down to Green Lanes' Gokyuzu for a meaty mediterranean feast and don't forget to wait for the free Turkish tea at the end. The food at Gokyuzu is simply fantastic. There is no other real way to describe it. I live pretty locally to Green Lanes so often head down but before now I hadn't visited Gokyuzu, not believing the hype. The hype, however, should definitely be believed as this is some of the best food I've eaten. Soft and succulent Karides (fried prawns with tomato) came first, followed quickly by Sucuk (Turkish beef sausage) that had a unique and addictive flavour - slightly greasy, but wonderful. Finally the kebab - Alti Ezmeli which consisted of char grilled tomatoes, red peppers and the softest lamb which was mouthwateringly good - I'm salivating just thinking about it. You can definitely run the risk of over ordering here - we had two starters and a main to share and were very full by the end. The Turkish teas and coffees at the end of the meal definitely finish you off. Having grown up in Greece, I grew accustomed to a jug of water, a basket of warm fresh bread, a tzatziki and a salad being brought to me, without asking and for free, as soon as I sat down in a restaurant. It is considered a cultural norm to greet your diners in such a way before they are ready to order. It was also customary to assume they'd be there for perhaps the whole day - no pressuring them to pay, or glaring at them to leave. Simple yet impactful service skills that made you feel comfortable and welcome. When I first moved to London I remember thinking how abrasive and impersonal eating out was; where was my welcome bread to snack on as I perused the menu? Where was my, not glass, but jug of water that I had to ask for three times? And why was I afraid to put my knife and fork down in case I'd unintentionally signal my having finished and for the waiter to try and clear my plate away? Things that now I am used to, but still do not like about some of the busy city life restaurants. 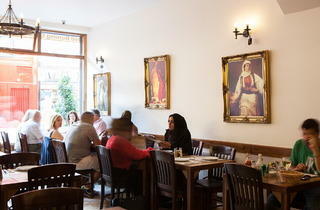 That is, until I first stumbled upon Gokyuzu, a Turkish restaurant in N8. I lived in the Harringay/Hornsey area for 8 years and am proud to say I was one of their original patrons and fans. Admittedly, I have been pretty useless in trying a range of things off of the menu; the large or jumbo sharing platters have always been my go to for a more than affordable, high volume, high quality dinner with friends. However many people they say the platter feeds, add at least one more person to that as you are confronted with a mountain, yes a mountain, of different cuts of chicken, beef and lamb atop mounds of tomato bulgar wheat (to die for) and fluffy lemon rice. And if you are unable to finish fear not, as it is more than normal for you to doggy bag the leftovers for a snack later on. I have friends who prefer meat off of the bone, and so have more than enjoyed the range of lamb mince pides and kebabs, and vegetarian friends who have found more than enough options to fill them up also. In summary, no matter where you live in London, the trek to Gokyuzu, on Green Lanes, will not disappoint and this echoes not only my opinions, but those of the countless friends and relatives I have taken there over the years that still go on about it today. 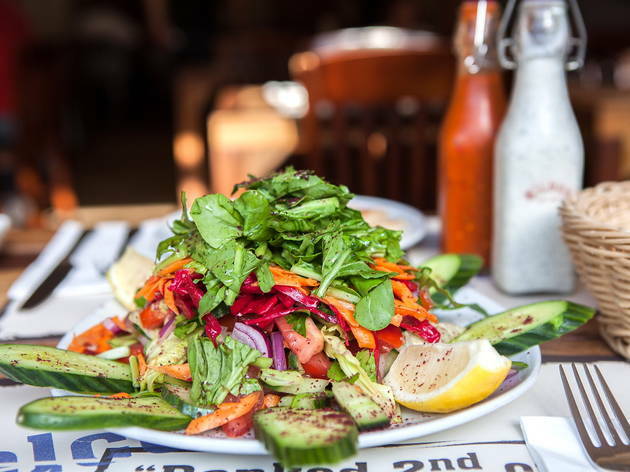 My only advice, try to not eat too much of that free on-arrival salad, bread and cacik (Turkish tzatziki) so you've got plenty of room left for a meal you won't soon forget! Seriously good food, unbelievable value for money (meal for 4x with drinks was under £80) and lovely staff. I really couldn't recommend here enough and it is definitely worth trecking out to Harringey for! Great for a group of friends or on a date night. Great food, fantastic service, and at a superb price. Looking forward to the newly refurbished restaurant opening next week. Good food, good price, great service. Best Turkish place on the ladder! Free salad and bread,plus decent cheap wine! 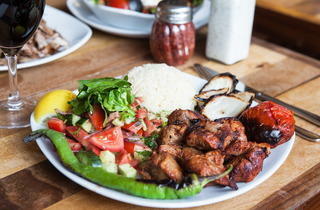 Enormous portion of juicy grilled meat, very friendly atmosphere. Very value for money! Always packed and deservedly so. Probably still the best of Green Lanes's many Turkish eateries. Really nicely prepared grilled meats when we went, also very fast and efficient service. Would definitely recommend. I absolutely love this p;lace. Food, glorious food. 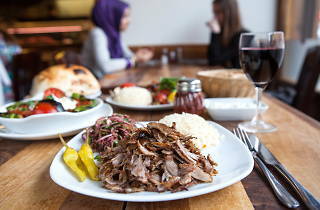 It's always named one the cheapest restaurants in London but thus green lanes classic is perfect for a affordable meal. The staff are friendly and the queue is always out of the door and you can see why. Make sure you book and have the platter if you can they are huge. So we just arrived in London from Aus and have just moved to Manor House. Check out Timeout for somewhere cheap and delicious locally and stumbled across this little gem! Just went there now and oh my god the reviews live up to the reality! Super busy but we got a table pretty easily, food was sensational, portions were ridiculous, the service was amazing and of course the food didn't disappoint. We had to roll ourselves back home. Five stars all the way! Ok I'm going to be honest with you, there is ALWAYS a big queue when I go there (around the evenings) but trust me when I say not only is it worth the wait, but the service is impeccable once you have a table. I can't believe it took me over four years of living in North London before I tried Turkish food on Green Lanes! This place is absolutely spot on... it's always busy, amazing value for money and the food is delicious and very authentic. 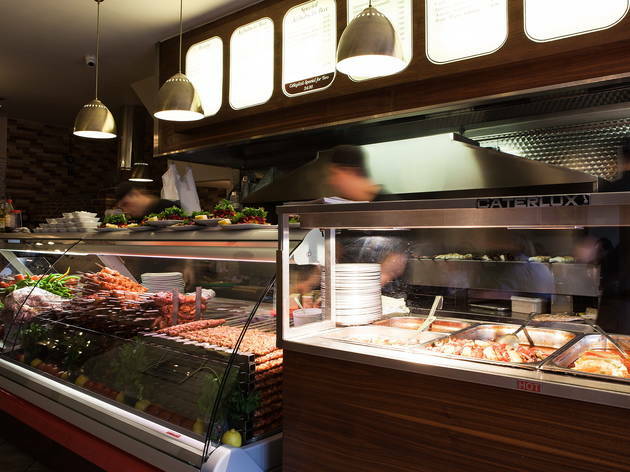 The only place to go for Turkish food in London. 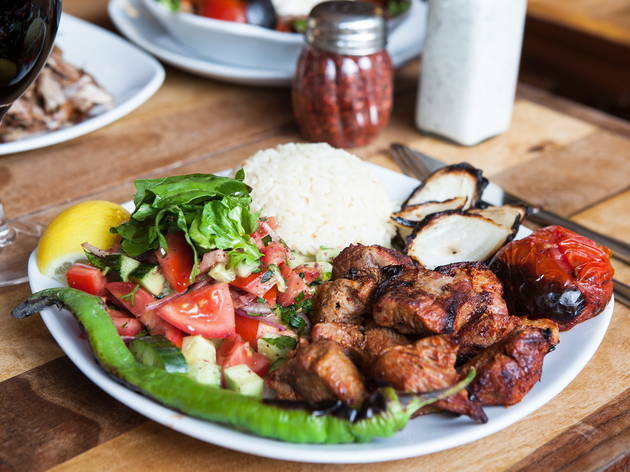 Excellent Turkish food, with a great family atmosphere too - more proof that Green Lanes is the superior destination for Turkish food in London over Dalston (which has some great spots too). My absolute favourite Turkish restaurant. Traditional family run joint, where the waiters never get flustered even though the place is bursting at the seams. You get so much bang for your buck here, and the chicken is of outstanding quality. Go hungry as it’s one for a feast! 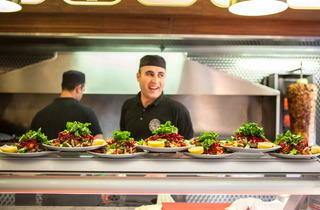 Harringay has lots to thank to the Turkish community living there - nice groceries and restaurants, opened late hours. Gokyuzu is a classic of the Turkish food in the area. Affordable and nhami. BEST TURKISH FOOD IN LONDON. 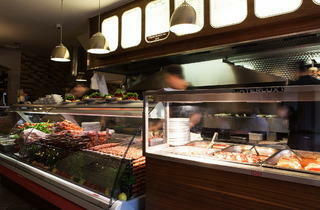 My favourite Turkish in Green Lanes - bustling atmosphere and great value. Love this place, yet to see anyone finish the massive mixed platter! Definitely the best Turkish food in town! Gokyuzu is one of the two Turkish restaurants I visit regularly on Green Lanes, Haringey. The meat, the free mixed salad and the often free tea (smelling of cloves) are really nice. The prices are low. I recommend the mixed kebab for 3 people. The only bad side is that they bring the bill to your table without you asking it, because it's so crowded. You can also take-away. I'd say don't go on a Saturday night because it's over-crowded and the kebab may not as good as usual. Go on a weekday evening or Sunday (for lunch or dinner). It has a really noisy atmosphere so it's not ideal for romance, but here is good enough with friends and family.